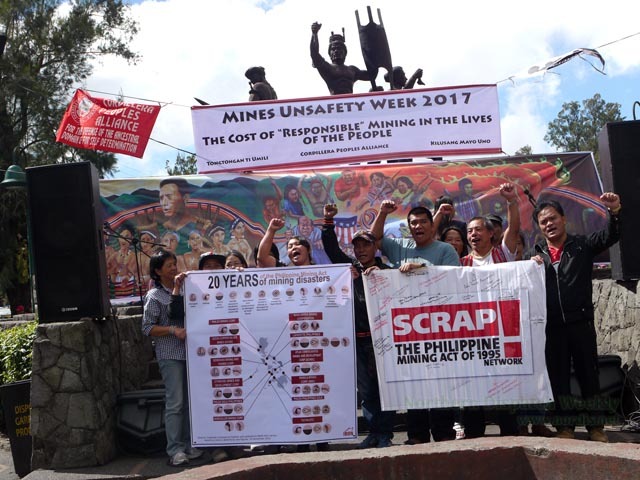 BAGUIO CITY — The Cordillera Peoples Alliance (CPA) reiterates that Philippine Mine Safety and Environment Association (PMSEA)’s claim of “safe and responsible mining” on the occasion of its 64th Annual Mine Safety and Environmental Conference (ANMSEC) in Baguio City is myth. Santos Mero, CPA’s deputy secretary-general, cited a long list of environmental crimes and human rights violations brought by mining companies in the region and other parts of the country as proof to that claims of safe and responsible mining has no basis. “It seems like PMSEA is continuing with its illusion that these large mining companies have been ‘safe and responsible’ all throughout,” Mero said. “Lest we forget the sink hole in and tailings spill in Itogon caused by the century old mining activities of Benguet Corporation and the Lepanto mining disasters in Mankayan that sunk households in 1999, 2009, and 2013,” Mero added. “They must be blind to also not see the destruction brought by years of Benguet Corporation (BC)’s open-pit mining operations. Adverse impacts to local agriculture, people’s livelihood sources, and the environment are still felt until today,” said Mero. According to Mero, Benguet Corporation is responsible for the open pit mine site, underground tunnels, waste dump sites, mill, and diversion tunnels and tailings dams in Itogon. He adds that the mining activities of BC and Philex Corporation in Itogon led to series of environmental disasters that claimed lives of the people and destroyed properties. Recent disasters brought on by mining include the sinking of a patch of land in Virac, Itogon and the collapse of BC’s tailings dam in Liang, Itogon resulting to destruction to the downstream communities of Poblacion, Dalupirip and Tinongdan in 2016. Mero further said that the threat of large-scale mining in the region continues. According to him, at least three-fourths of land in the Cordillera and adjacent provinces have been tapped for mining exploration by mining companies. “While interests by foreign and local mining companies continue to rise, we expect more of these environmental disasters to continue,” he said. Mero also elaborated on the risk of intensified militarization in areas where there are mining interests. “It has been known that these big companies use state troops to protect their interests,” he said. In the region, troops of the 7th Infantry Division Philippine Army are deployed where the Cordillera Exploration Company Inc. (CEXCI) are eyeing resource exploration ventures. “Militarization can only translate to human rights violations, where dissenting voices to these destructive projects are silenced,” he adds.